Storyboards, binders and online pinboards can organize design inspirations for your next remodel project. In the midst of winter, we naturally spend more time indoors. This usually means we become more intimate with our home’s interior — the good, the bad and the downright ugly! This is a perfect time to begin dreaming of your next remodeling project for the upcoming year. We recommend the tried-and-true process of creating storyboards by using a bulletin board, poster board or inspirational binder. Gather the item names, photos and ideas you collect from various sources. These are merely avenues to keep you engaged and organized, so when the time comes to begin the remodeling design process, you have a good idea of your needs and wants. As a Kitchen and Bath Designer, I spend a good deal of time listening to what my clients want both functionally and aesthetically. It is not critical that they know every detail of the design, but the ability to communicate their style through pictures is, as they say, worth a thousand words. I find that most often when a client shows me a photo from a magazine or an online resource, there is usually a certain feel about it or a single element they love. Expressing design ideas through images is a wonderful approach, because everything doesn’t have to be so literal. Many clients have come to me with just a few magazine clippings or a brochure from a big box store to get the conversation started, and usually that is all I need. I have also gained design inspiration from an eclectic array of objects — a favorite candle, a picture of mossy rocks or even fresh eggs from the household chickens. It doesn’t matter where you find the inspiration, but it is helpful to have a method to keep images, articles and notes in one place where you can look at them from time to time or store them in a safe place for later. Storyboard: Create a storyboard by collecting images on a bulletin board or poster board to keep track of ideas that inspire you. This is a quick and easy way to capture your inspiration and keep it in full view, without having to be super organized about it. This is more about creating a feel that provides daily inspiration. 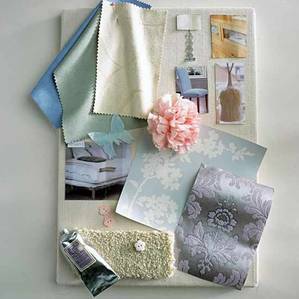 Magazine clippings, brochures, fabric swatches and paint swatches are all quite helpful for creating these boards. If you are remodeling your kitchen, you may want to visit local plumbing, lighting, tile or appliance showrooms to collect brochures and samples, or just take photos to download to a folder on your computer. Binder: If you really enjoy researching products and materials and love organization, the best idea may be a binder you can carry with you at all times. This can be divided into categories: products and materials, color palette, style, furnishings, etc. The beauty of these binders is they let you organize, add to and remove items as you see fit. Also, portability is key. It is always a good idea to have the elements that inspire you on hand when searching for something new to add to your collection. When we begin a remodeling project, we give our clients their own binder with all the pertinent information for their project, and it is always well used by project completion. Online pinboards and idea books: Thanks to the constantly expanding age of social media and other share sites, Pinterest is a wonderful alternative to the more hands-on approach of a storyboard or binder. The picture quality and organizational opportunities are certainly more advanced, and the storage space is endless. It is also quite convenient when researching online to just “pin” an idea as you come across it. Another amazing online resource for inspirational photos and products is www.houzz.com. You can create your own “ideabooks” on this site and share ideas with others. Another plus about these methods is the ability to share images electronically with your designer/remodeler when the time comes. These are just a few methods that can help you capture and visually organize your design ideas. No matter which method works best for you, you’ll have a guiding tool to keep you focused through a successful remodel project. We are in the process of gathering color ideas for adding a second bathroom upstairs in our small victorian home. I like the idea of finding an everyday object you wouldn’t think twice about but offers the central color you wish to plan around. I’ll keep my eyes peeled these next coming months.